In my role as a building administrator, I often find myself working to document my interactions with students and staff in a way that allows me the greatest flexibility and also provides a date and time stamp that makes reviewing and documenting the interactions easy. Recently I have been exploring the use of a Mac OS X application called Quicksilver. Quicksilver has been described as the Swiss Army Knife of productivity applications. At its simplest level it is an application and document launcher that can easily be invoked from the keyboard. For example if you wanted to launch the application Firefox, you would invoke Quicksilver, and begin to type the application name. Quicksilver will quickly find the application, and once highlighted all you need to do is hit the return key and the application launches. In addition QuickSilver, is extendable, and also allows you to work with applications and documents and invoke them to do tasks. For example, Garrick Van Buren has developed a plugin, QSPress, that allows you to quickly post to a Wordpress weblog directly through Quicksilver. I have recently been using this to jot down notes during classroom visits. The plugin takes advantage of categories, so my classroom visits are nicely organized on my private weblog for later review. In addition if I choose to I can easily take the same notes, and with a just a few keystrokes, quickly email them to the teacher using a Quicksilver extension that allows me to integrate it with my Gmail account. 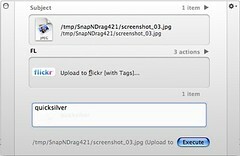 Another interesting use of Quicksilver is for posting images to Flickr. I sometimes find myself writing posts that include screenshots. I use a screen capture tool called SnapNDrag to grab these screenshots. SnapNDrag takes the screen shot and places it on the clipboard. Using the Flickr Quicksilver plugin, I can invoke Quicksilver, paste the clipboard contents, (which is actually the file path to the latest screen grab image...) and post it to my Flickr site. All with just a few keystrokes. Then from within Wordpress I can include the image in my post.